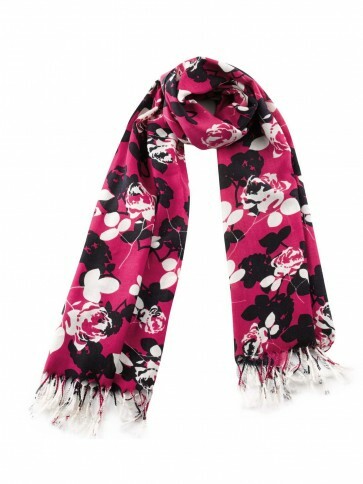 We love this generous wrap scarf in super-soft silky fabric - a gorgeous addition to any outfit. Wear over a jacket, sweater, or as a wrap on chilly summer evenings. Perfect for holidays, weekends away and chilly evenings. Cheerful hot pink, black and white pattern. Super-soft and silky to the touch. Approx size 70 inches long plus tassels, 27 inches wide. Buying clothing online, you'll want to ensure that you're ordering the correct size, so we recommend checking your measurements with the chart/s below. Of course, size and fit can vary from one brand to another, and also from one style/fabric/cut to another, so please use the chart as ageneral guide only. Chest 35-37" 38-40" 41-43" 44-46" 47-49" 50-52"
Collar 14.5-15" 15.5-16" 16.5" 17-17.5" 18" 19"
FREE on all orders over £50. £3.99 for orders under £50. Selected ranges will delivered the next working day as standard when you order before 3pm. Included product lines are clearly marked with a 'Free Next Day Delivery' icon on the product detail page. Other items on the same order may arrive separately. Exclusions apply. We hope you are delighted with your purchase, but if you change your mind or wish to return it for any reason you may do so within 30 days of receipt so long as the item is unworn, in its original packaging and with the tags still attached. The cost of returning an item is at your expense unless faulty or incorrect goods have been supplied.